Nana Addo Dankwa Akufo-Addo and his Npp after two years in office cannot boast of any development project in any sector of the economy. When juxtaposed with the performance of John Mahama’s administration, it becomes clear that Akufo-Addo is not and cannot be a match for John Mahama. If you do sector by sector juxtaposition of Nana Akufo Addo and John Mahama administrations you would observe that while Nana Akufo Addo has suspended the constitution of the republic and leading Ghanaians by the nose. John Mahama exhibited excellent democratic credentials by enhancing the rule of law. In just two years we have been proved right in our continuous assertion that when it comes to running the affairs of our country, John Mahama is far the better man and the NDC by far the better party. What I underestimated was the the high level of malice the President has for his political opponents and critics, the inexplicable pleasure that he derives in inflicting pain in his political opponents and critics and the strong desire to display incompetence, wickedness and recklessness. The President is more more concerned about the total annihilation and utter decimation of all his transducers. A leader is measured not by his ability to lie, terrorise his political opponents, humiliate and persecute political opponents but by the level of his humanity, his sense of decency, fairness and justice. Ghanaians were more prosperous under John Mahama. The nation’s economy was ranked among the best in Africa as against the terrible situation under Akufo-Addo. In spite of the CIA activities against the Nkrumah regime, the industrialisation drive of the administration took shape before the 1966 coup. The CIA’s own classified documents captured that Nkrumah’s seven year economic development plan would have seen its fruition in 1970. Under his industrialisation agenda, Nkrumah established factories across the country including Tema Steel Factory, Komenda sugar factory, Ghana Airways, Kumasi Shoe Factory, Jute factory, Takoradi floor mill, Tomatoe factory, state hotels, Tema Motorway, Tema Harbour, improved the road network in the country, hospitals, schools. The declassified truth is that NKrumah achieved remarkable successes as President of Ghana and that to date, his achievements are unparalleled. Apart from the projects executed by the Guggisburg administration including the Korle Bu hospital, Achimota College, railway lines between Kumasi, Accra and Takoradi, roads etc, all the major projects including the Tema Motorway,Komfo Anokye hospital, University of Cape Coast, the training colleges, Akosombo Dam plus those mentioned earlier were executed by the Nkrumah administration. 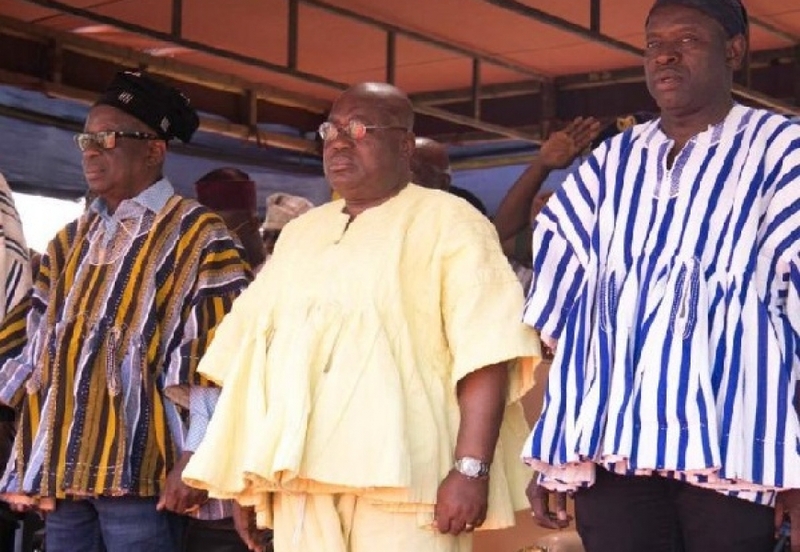 In spite of all these laudable achievements, his political opponents (Forebears of the Npp) after his overthrow, told Ghanaians the military administration and later, the Busia administration performed better than the Nkrumah administration. The military regime in 1967, devalued the Ghanaian Cedi by 30% relative to the UD dollar, various state owned projects were abandoned, including some which were at the completion stage, Agriculture projects including state farms were sold to UP elements and members of the military administration and new agriculture equipment purchased by the Nkrumah administration for farmers were left to rust. Overall spending on agriculture deceased by 35% and fleets of fishing boats were grounded. These fleets of fishing boats were lied idle and deteriorated leading to importation of fish. State properties obtained under Nkrumah fell into the hands of friends of the military leaders and their anti-Nkrumah. Under the NLC administration fewer people had jobs, food prices increased dramatically due to the collapse of the state farms and withdrawal of credit to farmers. Over 40,000 people lost their jobs in July 1966 and workers demand for 1cedis per day basic wage was rejected. Workers in Ghana went on strikes 58 times between 1966-1967, 38 times in 1968, and 51 times in 1969. With this terrible record fanatics of the military administration and their anti-Nkrumah elements told Ghanaians the military/Busia administration(s) performed better than the Great Osagyefo. In 1971, Prime Minister Buaia announced that there was a balance of payment problem for the deteriorating economy situation-but his fanatics still said he performed better than Nkrumah. The administration announced an exchange rate adjustment of about 42% in Dec 1971. Just like the Akufo Addo government of today, by 1971 the Busia administration had inflated our national debt by US$ 72 million in accrued interest payments and $296 million in short term commercial credits with nothing to show to justify that backward trend. Influential farmers started having problems with the Busia administration because of its austerity measures which had been recommended by the IMF. The middle class were severely affected. These bogus economic measures and their associated hardships precipitated protests from the TUC which led to the occupation of the TUC headquarters by the army which was vehemently condemned across the world. Fanatics of the NLC/Busia and their anti Nkrumah elements still said they performed better than Nkrumah and his Cpp. The Prime Minister said the accumulating debt were a temporary phenomenon but for the first time in the country’s history the Central Bank openly disagreed with the Prime Minister arguing that it was the result of a long term fiscal tracing it from the NLC days. In 1971 the Busia government’s move to go for a $45 million credit from the America Commercial Bank was rejected by Nixon because of the administration’s bad economic policies and human right abuses. Fanatics of the administration with all these horrible happenings rated the failed regimes above Nkrumah. We hear fanatics and friends of the Akufo-Addo administration say the administration has performed better than the Mahama administration but cannot point to Ghanaians a single project executed from the over Ghc 70 billion borrowed so far. On health, while Nana has neither initiated nor executed any project in this sector that has direct bearing on the welfare of Ghanaians, John Mahama repositioned this sector through a meticulous implementation of his Health development policy. Ghanaians now have access to better health care with new technologies that have better positioned our hospitals to handle medical emergencies and disease control using international best practices and cost effective interventions. He added over 6,0000 beds to what he inherited, built ultramodern hospitals across the country, teaching hospital, military hospital, polyclinics and chps compounds. Mahama fixed the decades old power crisis he inherited. He added more megawatts of power, the speedy completion and commissioning of key power projects as well as huge investments gas sector. In the same vein, President Akufo Addo cannot boast of any investment in road and schools construction. On security, the Mahama administration reequipped the security agencies and crime rate dropped to all time low under Mahama. The scary truth is that Ghanaians were more prosperous under John Mahama. Ghana’s economy was rated among the best in Africa, the Cedi was the second most stable currency in the subregion, Ghana’s business environment was rated the most attractive and business friendly in West Africa and the economy was projected to grow between 7-8 percent in 2017.